Thermostat Matters, Or Does It? An Air-conditioner with heat isn’t the only thing that you can hang on your wall to keep you warm. A more convenient and hassle-free option would be to look for the “little brother” of the AC. Check out the piece we have prepared for you and become familiar with how to pick one of the best electric wall heaters on the market. In our comprehensive electric wall heaters reviews and guide, you will quickly find out that a wall heater will save you space, money and time. It will give you enough heat to keep you happy and warm but without the gruesome installation ordeal and maintenance costs. We have divided our article into sections where you will see our handpicked choices, some pros & cons as well as comparisons. DIMENSIONS : 26.2 x 2 x 11"
DIMENSIONS : 4 x 17.5 x 18"
DIMENSIONS : 16 x 11.9 x 5.1"
DIMENSIONS : 13 x 3.6 x 16.5"
DIMENSIONS : 15.1 x 11.4 x 6.1"
DIMENSIONS : 26.5 x 26.5 x 3"
With its size, this convection heater can really give you a bump when we talk about heating a room. The clean design allows you to place the New Age Living Phantom 10 in any sort of premises. Since the main heating mechanism is convection, you will not hear a sound at all. The maximum power output is only 750W which makes this perhaps the most efficient product on the list. However, bear in mind that the lower output paired with convection means that your room will be slow to heat up. Once you are satisfied with the temperature, though, you will enjoy heat for cheap. There is a double safety thermal cut-out and there’s also IP24 water resistance. Thanks to these two characteristics, you can also place the unit in a bathroom. Use the built-in thermostat for maximum control over the temperature. Doesn’t have a remote control. Also, the body of the unit can get quite hot. 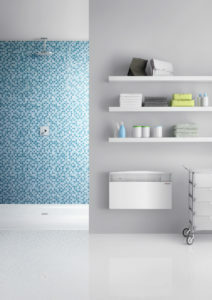 The top end design is what really sets the Stiebel Wall Mounted Heater from all other products. It has a slim body and will lie nicely on any wall. While it does have a thermostat included you can also attach it to an already existing one. A little setback is the presence of just the 120V output. If you have only 220V sockets, then you will need to buy a converter/adapter. The maximum temperature which the heater will give you is 86 degrees. However, this temperature is achieved at the expense of only 1000W making the unit a pretty efficient one. The product does not feature a fan but it is really not that much needed. Since heating is achieved through convection, you will still enjoy warm premises for extended periods of time. The only thing is that heating up typically takes a little longer. It weighs just under 10 lb. This wall heater will provide you with an excellent array of options as it can be purchased in different packages. You can decide not only on the maximum power output of your product but can also select the voltage. Basically, all sorts of combinations are possible and this will just slightly alter your price. The maximum power output you can get is 1500W. The craftsmanship of this wall heater is truly impressive. It features an aluminum fan and a beautiful white front panel. In fact, the whole design and functionality are patented and it is called Smart Limit Technology. As you place your order, you will also be asked to choose between a 1-Pole and a 2-Pole Thermostat. In short, you see that versatility is the main property of this wall heater. A little drawback is that the product cannot be installed vertically on a ceiling but this possibility is rarely sought for. In case you are looking for directional heat from a wall mounted appliance, this is your thing. The Heat Storm Infrared heater does not have a fan as it features the infrared heating technology. It will warm up you and your objects without wasting any energy on heating the air. Not only that it is a compact appliance, easy to clean and efficient, but it also comes with a remote control. Ultimately, your convenience is taken care of. You can also use the LED display on top in order to control the temperature or program the timer. However, upon a power outage, you will need to restart it manually as it won’t remember the settings. Thanks to the Cool Touch feature, the unit will never get too hot to be touched by a family member. 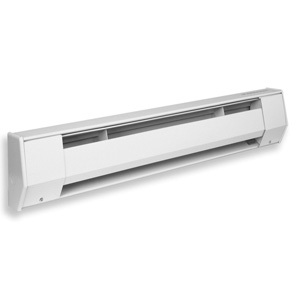 The presence of the fan will definitely boost the heating capabilities of the heater. Comes with a 1-year warranty. We are now coming back to earth with a little bit more common wall heater which is, by all means, a very nice one as well. The main feature here is that you can alter between 120V and 2W0V. This brings you a lot of energy efficiency because the 120V mode goes with a 750W of output. The 220V one is paired with 1500W of heating power. 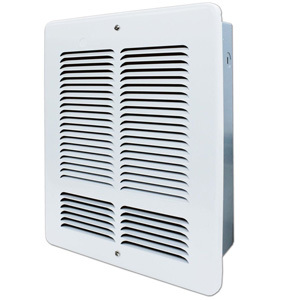 The front panel grill is also designed in such a way that it blows the hot air downwards. It is made out of heavy 20-gauge steel which will give you warmth for longer. There is only one dial for you to operate and it sets the temperature from “high” to “low”. The motor is permanently lubricated. This is a huge advantage as you won’t need to regularly unmount and take apart your wall heater for maintenance. You do not need to install it in a cutout in the wall. Surface mounting is also an option. 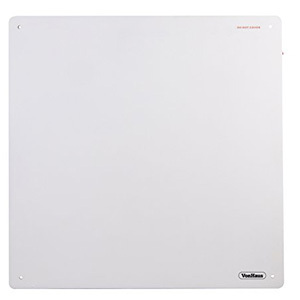 The thinnest wall heater on our list is the VonHaus Flat Panel Heater. When they say “flat” they mean 0.4 inches flat. According to some, the design is revolutionary but according to others, it is just a white tile sitting on your wall. This is why the designers made the heater completely paintable. You can put any color of paint over the device without compromising its integrity and functionality. The body is ceramic and even if you paint it, no smell will come out when it is working. The thermostat is built-in and the user has no power over the adjustment of the temperature. The heater features only an “on/off” button and that’s it. Installation is made simple thanks to the fact that all fittings are included. Don’t worry about burning hazards as the heater has a cool touch edge. An important safety note to mention here is that you must not install this heater in the bathroom. A wall heater doesn’t have to be the primary heating device in your house in order for it to be useful. What it does is provide you with some warmth and it does it fairly quickly. Such a gadget needs around 2-3 minutes to start radiating heat and depending on the model, it might also include a fan. 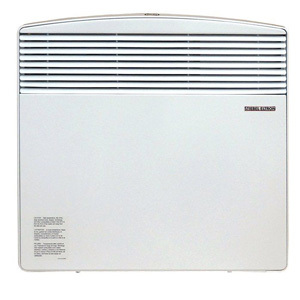 This is a common feature of most top brands on the electric wall heater market. So quickness is definitely one of the major upsides of a wall heater. You don’t want your heater to start wasting all this electricity and give off warmth only after 10-15 minutes. The portability of this device allows it to start functioning quickly and it yields fantastic results. It is great when you want to heat just one room or several rooms separately. Smaller homes typically do not have central heating. What you can do is maybe buy 1-2 of these wall heaters and distribute them around the premises of your home. One of the most distinguished and unique qualities of wall heaters is that they will save you plenty of space. The floor has only this much square footage and you cannot put countless things on it. Furnishing is demanding enough and often times there’s not enough room for a heater. Attaching it to a wall will basically turn the electric heater into a picture or a poster. The best part is that people will rarely notice it as it truly blends in with your environment. 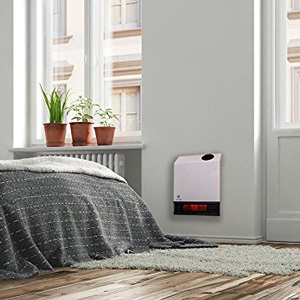 Take advantage of your floor space fully by obtaining a wall heater. Mounting the gadget onto a wall or removing it afterward is also not something which is very challenging. There are those models which require a cutout in the wall to be made initially. When it comes to them, a DIY installation might not be the brightest idea. Still, such heaters aren’t hard to mount but they definitely require some knowledge and proper tools. If you aren’t sure how to exactly cut a hole in the wall and connect all the wirings, then look for a professional. The same goes when it is time to remove an electric wall heater. It is especially important to have professional help when detaching the wiring. There’s electrocution hazard when doing this and it can threaten your life if you aren’t careful. Again, all of these procedures are rather simple when you know exactly what you’re doing. Thanks to the materials out of which wall heaters are made, they can retain some of the heat even after you turn them off. We aren’t going to dabble in the topic of how do electric wall heaters work but will only mention a few things. 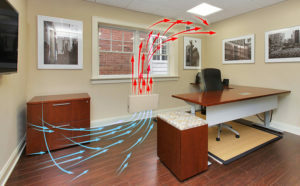 Convection allows the room to get warm evenly. This also allows the heat to remain there even after you plug the heater off. Yes, it takes longer for the temperature to rise but it doesn’t go down as easily as well. Another reason is the body of the wall heater. Some panel heaters are made of aluminum or specialized steel only to retain as much heat as possible. 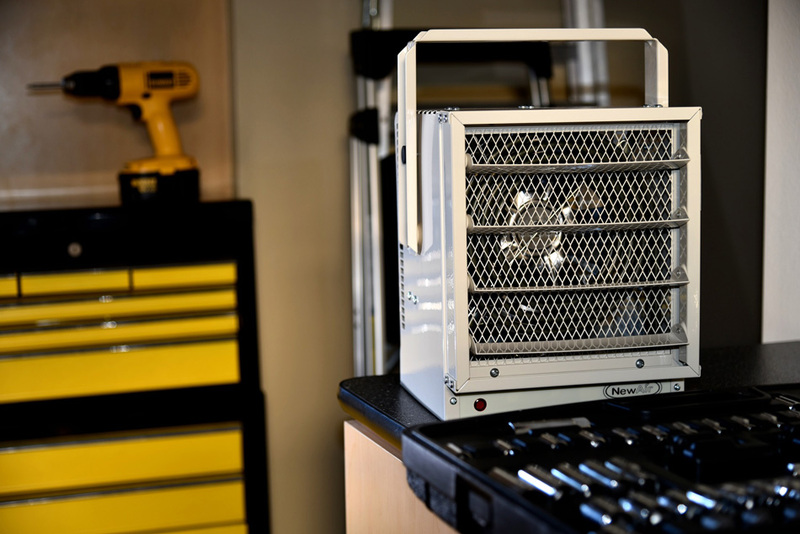 The metal body of the device stays warm and keeps radiating heat even after the flow of electricity stops. There aren’t many disadvantages that we are going to outline here but we still have to mention a few in order to really call this guide a complete one. These drawbacks are really not deal breakers but you should keep them in mind before swiping your credit card. A regular wall heater will hardly solve all of your heating needs during the winter. Yes, if you live alone in a dorm such a device might suffice but a family of four will need more than that. A wall heater is a great addition and it is nice to have it playing the role of a complementary heater but not a primary one. It just isn’t that powerful and even though there is some efficiency related to it, the amount of heat provided is not going to be outstanding. You can’t move them. Once you attach them to your wall you will need to also take out the whole frame if you want to install the heater somewhere else. Not to mention that the ones which require a cutout in the wall are practically impossible to relocate. Once you put a wall heater somewhere it sort of becomes part of the infrastructure of your home. The lack of mobility is definitely a drawback as electric radiators or floor heaters are easy to move from room to room. Depending on how you want your wall heater to turn on and off, you will need to decide on the connection. If you install it during a renovation then you will have the opportunity of having a separate switch especially for it. Otherwise, you might have to connect it to one of the light switches. This means that there will be a dependency between your domestic lighting and the wall heater. Every time one is turned on, the other one will also be operational and vice versa. Most things related to domestic heating are all about preference but money definitely also matters. However, we cannot skip talking about other aspects of these two heating devices. Here’s what our research and common use show us. In terms of space, the wall heater definitely wins. These machines are smaller than an air-conditioner and they are not as bulky. True, some panel heaters are just big squares basically, but their body is rather slim. That’s not the case with an AC. It possesses a longer rectangular shape and even has an outside unit. The outside unit makes noises and water leaks from it. It will take up space on your porch if you have one and you will constantly need to go out and wipe some water off the surface. A little downside of the wall heater is that you should have any furniture near it. You should have at least 3 feet of distance between your heater and upholstered units or electrical devices. After all, safety always comes first. The AC won’t give you such spatial limitations. Without a doubt, an Air- Conditioner is significantly stronger in terms of power. Wall heaters will rarely give you anything more than 1500W. The amount of heat and the speed by which it is provided is in favor of the AC. Now, this is where the wall heater really shines. It is a device which will give you nice, efficient heating options. Both the initial sum and the monthly electrical bills that you will pay should be lower than using an AC. The initial sum that you have to pay for an air-conditioner with heating is at least 6-7 times bigger than what you will pay for a wall heater. It is believed that over an extended period of time this initial investment is worth it because of the “efficient heat” that you get from your AC. In short, people suggest that you will end up paying less for electricity and this is why spending $700 for an AC is alright. This statement is somewhat wrong because you will struggle to find a significant difference in favor of the AC when it comes to your monthly electrical bills. A wall heater works at lower wattage but still gives off a fairly decent amount of heat. Thanks to this property, even if you pay 10% more monthly for electricity in comparison to using an AC, you will still save more money because of the retail price difference between the two. This category is another example of how practical a wall heater is. Not only that, but it will also save you money as most AC retailers also charge a fee for installation. This alone goes to show you that mounting an Air-conditioner is an endeavor which requires technical skills and time. To make matters worse, you also need to have an outer unit attached in front of the room in question. The two units are interconnected and this means a hole in the wall needs to be drilled for the connecting tube. Typically a stand is also required for the outside unit along with noise reducing rubber tips. You need to be prepared to pay an additional 10% of the price of the AC for installation. You do not have such hassles when we talk about one of the energy efficient wall heaters. Mounting this device can be considered to be a DIY project as it requires a screwdriver and elementary knowledge in electrical connections. Now when we talk about a complete wall mounted heater which requires being built-in the wall, you should, of course, get a handyman. Maintenance is also tougher if you possess an air-conditioner. Not to mention that it requires annual checks by technicians. There are certain parts which require changing and that will force you into additional expenses. By opting for a wall heater you basically have no further headaches related to changing any parts. As long as you keep it clean by dusting it and make sure it doesn‘t short circuit, you will be all set. Dust it once in a while and make sure it doesn’t interact with any water or upholstery. Yes, that’s it – not very hard, right? What an AC does is take the outside temperature and then invert it to the one you want indoors. This is why the outside unit blows cold air and the indoor unit spreads heat. However, this comes at the cost of a lot of energy. Yes, you will enjoy decent temperature in your house and it will be tailored to your liking. However, an AC constantly blows the air around. Many people find this to be rather inconvenient as a non-stop draft has a number of negative aspects to it. More often than not, it can turn out to be detrimental to one’s health. If you check out our wall mounted convection heater reviews above you will quickly find out that the principle of operation is totally different from the one an air-conditioner has. Convection heaters will warm up a room gradually and evenly. While you might need to wait just a little bit longer than other typical floor heaters, you will be happy with the results. Furthermore, once you turn off an AC, you are losing all hope of retaining any warmth. The aluminum body of a wall heater gives you residual heat. 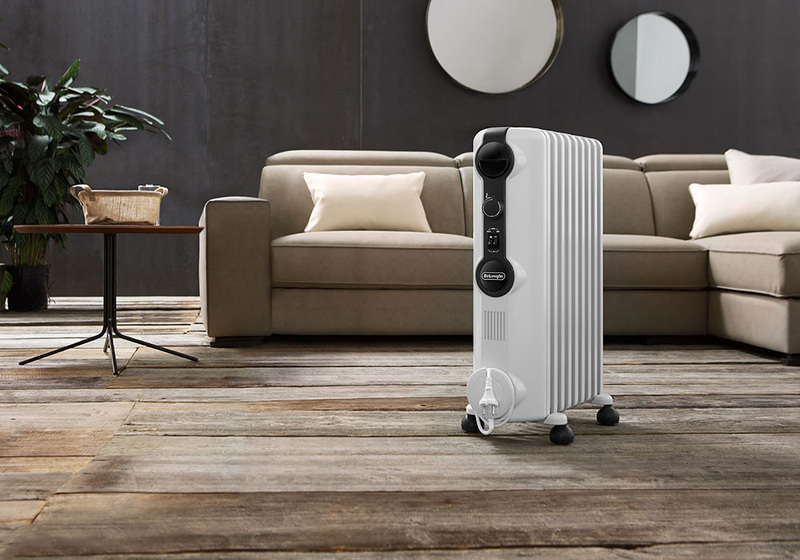 Now that we have seen all the advantages and disadvantages of electric wall heaters it is time to outline their most important characteristics. You will notice that some aspects are pretty much the same as most energy efficient space heaters but there are some niche features inherent only to energy saving wall heaters. Thickness rarely matters when we talk about wall heaters. Their bodies are usually slim and that means that the only dimensions you should be careful about are width and height. The models which require being built-in the wall are the exclusion to this rule because you need to know how deep it needs to go in the wall. You should also plan your furnishing accordingly. That’s because nothing should interact with the heater or be close to it than 3 feet. This is rather important as otherwise, you will have some safety risks. Another aspect as to why dimensions matter is related to your wall decorations. You don’t want to have just the heater there on an empty wall. Make sure you have some decoration around it but make sure everything is in compliance with the safety instructions. When you take a look at most heating and cooling systems out there you will definitely notice some similarities in energy consumption. That doesn’t mean that you should just rush and get the first available product. Think about the size of your room. The larger it is, the stronger wall heater you will need. A 2000W one is pointless in a 100 square feet room. In this case, you should aim at getting something smaller which will end up using very little electricity and will still provide you with a lot of heat. Check how many different power output settings you have. 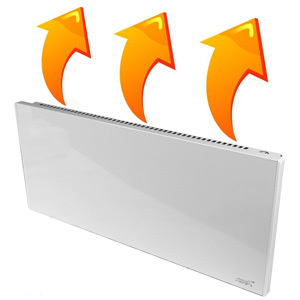 The best wall heaters will have at least two – high and low. Some other products directly have degrees written on the dial. They rarely let you know anything about the wattage but give you certain temperature depending on the setting. Another popular function is the timer. It is a convenience which shouldn’t be neglected. Yes, you will likely have to pay a little bit more than average for such a wall mounted heater but it is completely worth it. A timer gives you more control and lets you sort of forget about the wall heater. The design is usually directly linked to the way a wall heater functions. Some of them feature infrared technology and others are efficient space heaters. The composition determines the functionality to an extent. 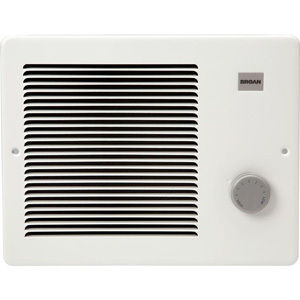 The simpler metal wall heaters feature a clean design with very few things and dials on the panel. This way the whole body gets heated and when you turn them off you get heat for extended periods of time. It is not 100% obligatory for a wall heater to have a thermostat dial. Most products will have that component built-in. This means that your interference is not required in order for the wall heater to shut down after reaching a certain temperature. In other cases, you will have a dial on the front panel allowing you to set the temperature or at least the intensity at which the device will shut off. Many people find this the more convenient option as it gives you total control over the duration of which the wall heater works. Who doesn’t like a machine which blows hot air around during winter nights? A fan will definitely make a difference as the feel of warmth will be easily spread around the room. Furthermore, it will feel like the temperature is higher than it actually is. If you can live with the slight noise, then get a wall heater with a fan. You can even dry clothes around it or even deal with unwanted moisture on the ceiling. Just know that it might increase the electrical usage of your heater. This brings us to the end of the buying guide we prepared for you on the topic of the best wall heaters. We believe we have highlighted all the important elements of getting the most suitable product for your needs. Please feel free to point out any aspects that we might have overlooked in our electric wall heater reviews post. If you think our research was useful and sufficient please comment and share the article. Go through the whole thing again if you want to be reminded of certain details and only after that, buy the heater you like the most. Read our other guides as well and as always – stay put! © 2019 Home Climate. All Rights Reserved. homeclimate.net is a participant in the Amazon Services LLC Associates Program, an affiliate advertising program designed to provide a means for sites to earn advertising fees by advertising and linking to amazon.com.